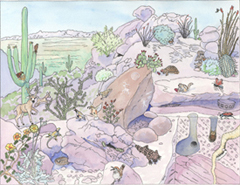 If you visit the Sonoran Desert you will see many different types of animals and plants. Exactly what you see will depend on the time of year and the time of day you are looking. Do you know the difference between a diurnal and a nocturnal animal? Animals that are diurnal are usually awake and active during the day. 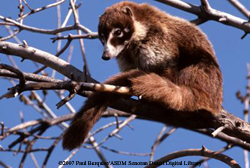 Nocturnal animals are usually awake and active during the night. Some animals can be both! In the Sonoran Desert, many animals are active at night because it is a good way to avoid the extreme daytime temperatures. In the heat of the day many diurnal animals will rest in the shade of a plant or under a rock. During the winter months when it is cold outside, many animals will hibernate or be less active. 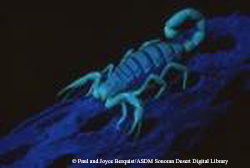 In our new Sonoran Desert Seek and Find you can choose to find information about nocturnal or diurnal animals. You can also learn about some of the very special plants that live in this area. 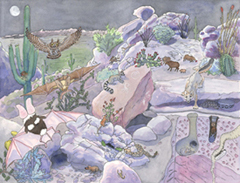 To begin your adventure, click below on either the nocturnal drawing or diurnal drawing. Then run your mouse over the picture and click to learn about something that interests you.